A little bit on The Law of Attraction. Do you read The Secret? 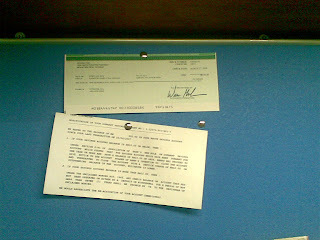 My Vision Board: A Check from Google and a Bank Statement. 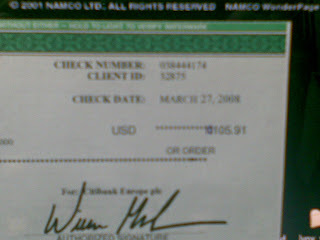 My Aim: A Check with an extra 10 in front of the figures. Sometimes, We’re too smart to fool ourselves and I believe by practicing it in the most origin way may works far more effective than other smart ways that you may think of. I’ve just bought…rent…subscribe a powerful server from a hosting company. It’s not a small amount as the server is quite a good one….well…depends lar. Anyway, despite the stupid latency due to Malaysian Hosting Provider: Streamyx. I always think that is a bad name as you can literally describe as Stream?X while X=No. Anyway, due to some reasons I had to have this server. Thanks to Figo for sharing the hosting fees and in order to return his favor on this matter…I’ll share out my old hosting from bluehost (actually quite a good one if you’re not using it for heavy application.) and I’ll also teaching him whatever I know on Search Engine Optmization (SEO), Python, DotNetNuke (DNN) and some other tricks like hacking some lousy system to get back your control….like erm…nvm. So, instead of teaching without a guide, What I’ll do is start blogging on DNN and Python while adding some spices like SEO and tricks. I hate to say that but I’m pretty broke now. You can called me Internet Begger if you like but with the nice check that I drew, it will keep me going on until I get that number every month just from the Internet! It will motivate me! Don’t call me money minded, you’ve no idea why most rich men are broke before they become millionaire. I’m George Geranium and I will make history!